At ‘Black Lives Matter’ demonstrations across the country protesters have been chanting: “What do we want?” “Dead cops.” “When do we want them?” “Now!” Not too long after these demonstrations first appeared, a black man named Ismaaiyl Brinsley, of Baltimore, assassinated two NYPD police officers as they sat in their patrol car in Brooklyn supposedly in retaliation for the deaths of Michael Brown and Eric Gardner at the hands of police officers. In July 30th of this year, Nation of Islam leader and Black Racist Louis Farrakhan said that the whole American system had to be taken down and that White people were the enemy. He called for “ten thousand fearless black men to rise up and kill those who kill us. Stalk them and kill them.” He was, of course, not only talking about white people in general, but he was talking about killing police officers, particularly white police officers. Louis Farrakhan and the Nation of Islam, along with the leadership of the ‘Black Lives Matter’ movement, the New Black Panther movement, Socialists politicians and the usual groups of fellow travelers of anarchists, Marxists, Black Racists and communist groups are actively promoting the murder and execution of police officers and white people. I believe that it is important to point out that a large majority of Black people in America flat out reject and strongly disagree with the ‘Black Lives Matter’ movement and their tactics. Proof of this was Farrakhan’s call for a repeat of the 1995 Million Man March in Washington DC that was held on October 10, 2015. Only a few hundred black people and a smattering of whites showed up and were vastly outnumbered by members of the media. Farrakhan’s own group members didn’t even show up in any big numbers. We know from the 2015 riots in Ferguson, Missouri and Baltimore, Maryland that outside, professional paid agitators were brought in to stir up the young people with lies about the police killing black men. We also know that many of these mob actors who burned and looted, were being paid from organizations that receive funding from social justice organizations and the likes of George Soros and even the federal government. The nationwide protests are peppered with anti-white and anti-police hate speech, professionally printed signs, profanity, and young black men with their pants falling down. To make matters worse, Barack Obama, America’s first anti-police, anti-white and anti-Christian president, makes a habit of chastising police for their alleged misbehavior, long before all the facts are in and he has been wrong every single time he has done it. He gives the impression, by his words and actions that he doesn’t really care about the lives of police officers, even those killed in the line of duty, while he continually fans the flames of anti-police rage by honoring the criminals who have killed by police. Obama honored Freddie Gray, who had over 20 criminal cases filed against him before his death in police custody, by sending Cabinet Secretary Broderick Johnson, chair of the Obama administration’s My Brother’s Keeper Task Force; Heather Foster, an adviser in the White House Office of Public Engagement; and Elias Alcantara from the Office of Intergovernmental Affairs to his funeral. Obama also sent three government officials to Michael Brown’s funeral: Johnson and two officials who worked in the White House Office of Public Engagement, Marlon Marshall and Heather Foster. Yet, for the funerals of police officers killed in the line of duty while he has been president, he has sent no White House representatives. Many protesters around the country continue to use the chant “Hands Up – Don’t Shoot” to somehow indicate that Michael Brown was shot while his hands were up. It didn’t matter that Michael Brown just committed a strong-arm robbery, assaulted a man much smaller then himself and was attacking a police officer and trying to take the officer’s gun before he was shot. During the filming of some of the protests, TV news reporters asked some of the participants in these marches what was the meaning of the slogan “Hands Up – Don’t Shoot” and many didn’t know. Yes, the useful idiots were out there protesting, but they really didn’t know the facts of the cases they were protesting. They could just as easily have been told to yell out the slogan “Pants Up – Don’t Loot.” It really didn’t matter. All they knew was that they were protesting the murder of black men at the hands of white racist police officers. Again, the truth didn’t matter. President Obama espoused the opinion of other race-baiters when he claimed that the riots were: “An understandable reaction… and that blacks’ distrust of police was “rooted in realities.” Really? Our race-baiting president lied once again. What realities was he talking about? The “Black Lives Matter” leaders have been invited to the White House to meet the president. Have the wives, fathers, mothers, brothers, sisters and children of murdered police officers ever been invited to the white House to meet the president? Absolutely not! There is, of course, no proof that blacks are currently being treated differently under the law, but the truth never seems to matter to President Obama. He didn’t have to present any facts about actual injustice. All he had to do was give the perception that such injustice existed. The innuendo to be taken from the President’s remarks was that most white police officers in America are racists and that he and the federal government had to step in to solve the problem. What race-baiters like President Barack Obama, Al Sharpton, Jesse Jackson, Louis Farrakhan, Democrat party leaders and the mainstream media have in common is their desire to portray blacks and other so-called ‘people of color’ as permanent victims of a white, racist society. Permanent minority victimization is the standard to be used in the true politics of racism. The race-baiters must constantly remind blacks and other minorities they are being treated unfairly by whites and they need to support minority leaders and minority organizations in order to obtain social justice and level the playing field. The American people are very well aware that Police Officers have a very tough job. On any one day, he or she must be understanding, diplomatic, know first aid, be calm when others are excited, take control of situations when tempers flare, physically subdue criminals, comfort people suffering a loss and have a host of other positive attributes. Although people may not want to see a police officer when they glide through a stop sign, they will surely be glad to see one if someone is breaking into their apartment or threatening to assault them. Police Officers throughout the country are truly the last line of defense for their fellow Americans against the criminal element in our society as well as those political radical activists who seek anarchy in the streets. Police Officers in America take an oath to protect us from the bad guys and to protect and defend the people’s rights that are protected under the U.S. Constitution. It can be a thankless job. The newspapers and TV stations sensationalize certain situations to sell papers and increase viewership, often ignoring the hundreds of thousands of heroic, life-saving and life-threatening acts police officers perform every day. There is little doubt that the combined race-baiting words and actions of President Obama, Al Sharpton, Jesse Jackson, Louis Farrakhan, Mayor DeBlasio, the national media and others have directly led to the deaths of Police Officers at the hands of black men who had been convinced by the race-baiters that police officers were the enemy of blacks. Race-baiting words and actions on the part of politicians, activists and other individuals that eventually lead to riots, injuries of non-participants and/or the violent death of one or more innocent people, including police officers, should be made a serious violent felony crime and those who practice this heinous, racist crime should be prosecuted. In response to the anti-police ‘Black Lies Matter’ protests and the recent murders of police officers in different parts of the country by criminal thugs, the Oath Keepers organization, made up of active duty and retired police officers veterans, firefighters and other emergency response professionals, has begun to hold rallies in front of police stations to show the police officers that the American people support them. At these rallies, people from the local neighborhoods and towns came up to the Oath Keepers and their supporters and were 100 percent in support of the police. People were driving by honking their car horns and giving the “thumbs up” sign in support of the police. Some people even brought food and water and said they would pray for the safety of the police. 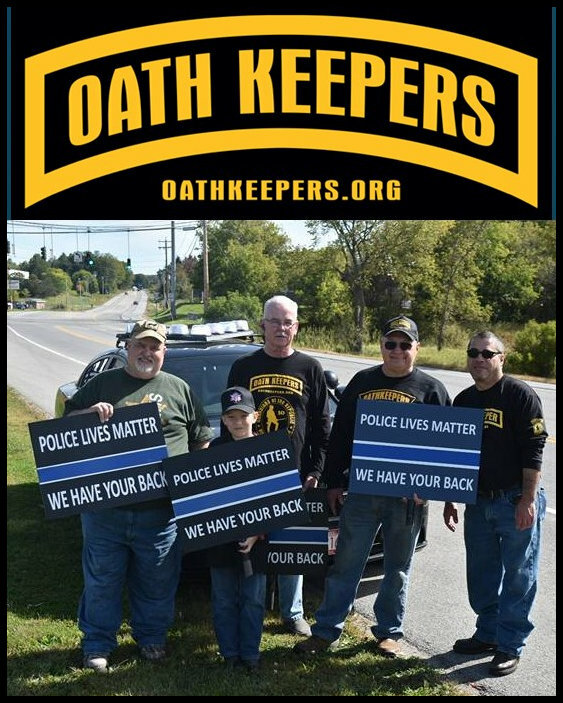 The Oath Keepers will be continuing to show our support for the police at local police stations (with no speeches) and hope that other groups of people expand these small rallies. During the course of these rallies, police officers, state troopers and deputy sheriffs stopped by to thank us for our support and the support of other local citizens who had joined us. To all the dedicated and honest police officers out there patrolling the streets of this great country and keeping us safe, I want to tell you very clearly that the anti-police protestors made up of a group of assorted disgruntled racists, anarchists, Marxists, communists and their fellow travelers, misfits, naïve college students, leftist professors, professional agitators, thugs, socialist politicians and just plain uninformed dopes, looking to get their mugs on TV and in the newspapers, represent a very, very small percent of the American people. They are the true ‘One Percenters’ because they represent less than one percent of the American population. They get a lot of publicity because the press seems to be in a leftist feeding frenzy and will show up even if there are only 10 or 15 ‘Black Lies Matter’ protestors. THE OATH KEEPERS AND THE AMERICAN PEOPLE HAVE YOUR BACKS! I believe in the law, and there are many good policemen out there. We need to stand by them during this crazy time an support them. They have taken on a job that many of us would never have the guts to do.